After completing his studies in Australia, Darshillan R moved into a condominium in KL where his car was always parked in the parking lot. There would be a specific person going around cleaning cars every week for a certain fee, so Darshillan subscribed to this service. This went on until he moved to a new condominium a year later. 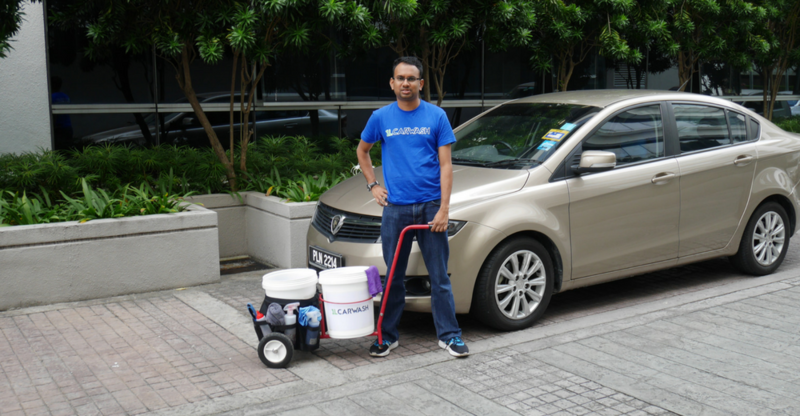 To his dismay, there was no car washing service at the building nor at his work place in KLCC. Two questions popped up from this experience. Firstly, why wasn’t there a service to clean cars while they’re parked for 8 hours during the day in the commercial parking lot and secondly, was there any issue with the car wash guy carrying two buckets of water on his bicycle? He found out the problem was that there is too much public movement in commercial buildings and any water puddles on the floor spells trouble to the building management. The question of security also comes into play, as most of the guys on the bicycles are foreign migrant workers without proper working permits. So Darshillan took this matter into his hands and developed a method of washing cars that will not splash or spray water but is still able to clean cars regularly in commercial parking lots. When he wanted to start his car wash service, Darshillan also wanted to include the social enterprise aspect to it. He thought of two areas that he could tackle with 1L Car Wash: water wastage and employment for underprivileged people. “I had the privilege of growing up in a neighbourhood that housed an orphanage consisting mostly of youths. I used to spend my evenings playing Takraw with these youths. I realised that many orphanage youths and other youth groups dropped out of school due to various reasons including to support their ailing families financially by taking up odd jobs,” said Darshillan. Unfortunately, many of these youths are exploited by mainstream employers due to not having a Sijil Pelajaran Malaysia (SPM) certificate. So he decided to focus his business on helping them out through his own means. The idea that Darshillan and his team of 3 came up with was a mobile car wash business. The team designed a device that is easily transportable to bring to customers and have their car washed weekly or every fortnight. “Using our cart and two bucket wash system with grit-guards, we are able to then go to different locations every day in a week and carry out the wash there for customers who have subscribed to our service,” said Darshillan. Their official website has an online booking system where customers can subscribe to their services according to the package they’d like. 1L Car Wash does offer an on-demand car wash service on the day they operate in a certain location. The type of packages offered by 1L Car Wash.
All the washes will be done by trained youths from MySkills Foundation which is an organisation focusing on aiding youths in crisis. Darshillan said that most of the 16 to 18-year-olds initially come from challenging backgrounds. They have all been re-trained at the Foundation prior to being sent out for employment. Afterwards, 1L Car Wash will then give them an opportunity to learn a trade and further allow them to learn how to start and operate a business. “This is so that when they reach the age of 18, we aim for them to think of starting a business of their own instead of being at the mercy of employers that may continue exploiting them,” said Darshillan. 1L Car Wash operates on weekdays with regular business hours as their target customers are people who travel by car daily to work. The on-demand service can be booked up to 1 day in advance. Currently, the team mainly operates in the Putrajaya and Cyberjaya area with plans of expanding further soon. “Our aim is to grow to 100 operating locations in 2017. Besides growing in locations, we are also presented with opportunities to become a fleet service provider by maintaining the of cars for rental car companies,” said Darshillan. 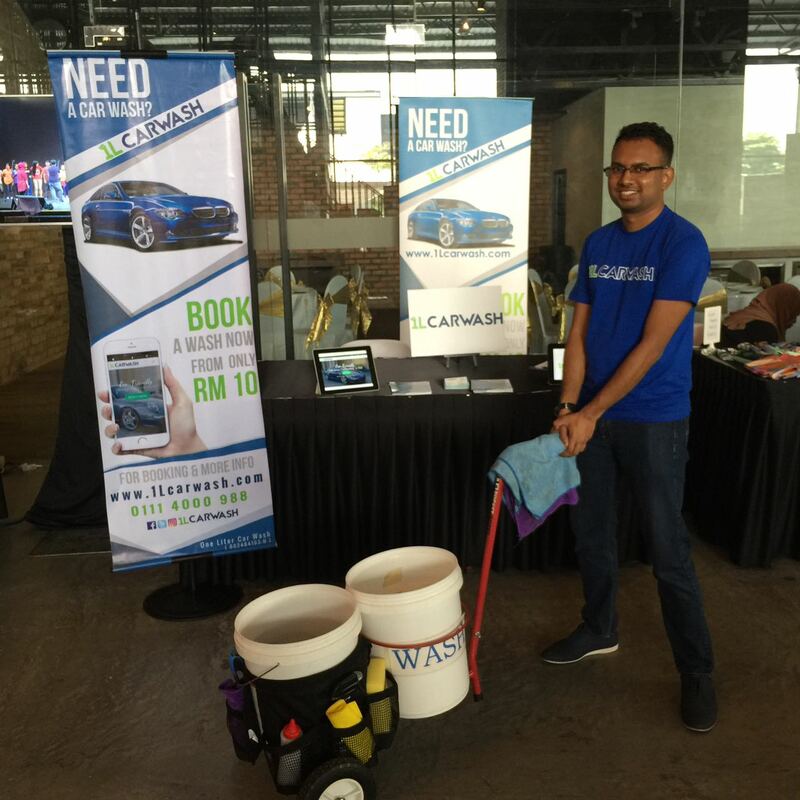 Darshillan believes that the car wash business in Malaysia is a huge market because we Malaysians rely heavily on cars for daily needs. “Our business model allows us to operate in any indoor parking lot condition and through a seamless online subscription system and cashless payment systems, we are able to get customers to use our service to get their cars cleaned regularly. We are also looking at offering other value add services such as onsite waxing, polishing, water mark removal and headlights restoration as we grow the business,” said Darshillan. 1L Car Wash uses the inconvenient aspect of typically getting a car washed as a pulling factor to their service. By bringing the service over to the cars, customers avoid the hassle of driving to the stations and wasting time waiting. The team also makes an effort to send text messages to customers once they have finished washing a customer’s car, informing them how they helped save the limited precious water resources and also helped provide a second chance to the underprivileged youths to remind people on the purpose of their enterprise. “We also channel some of our profits to clean water supply projects through another Social Enterprise, Saora Industries. 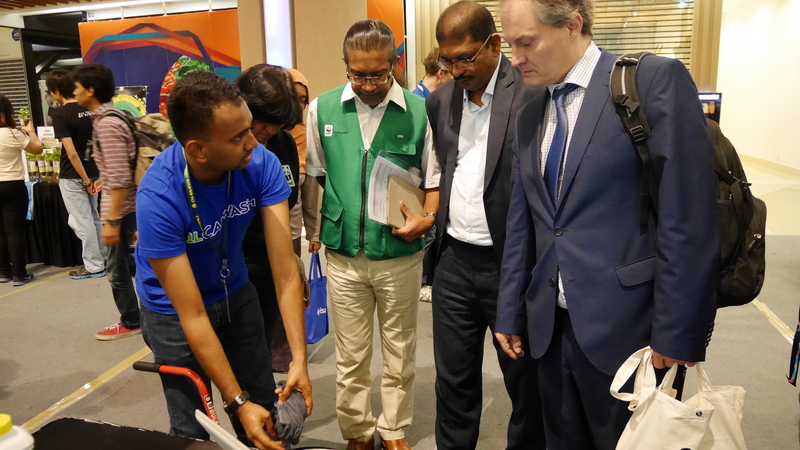 Through these activities and social media postings, we aim to encourage the consciousness of consumers to reduce the wastage,” said Darshillan.